The key to seasoning the turkey with this butter rub is to blot the bird dry, which enables the rub to adhere to the skin. You can also stuff the turkey, but it takes about an hour longer to cook. 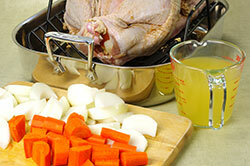 An instant-read thermometer is a must for ensuring a perfectly cooked bird. Remember that the internal temperature will increase by a few degrees once the turkey is removed from the oven. 2. 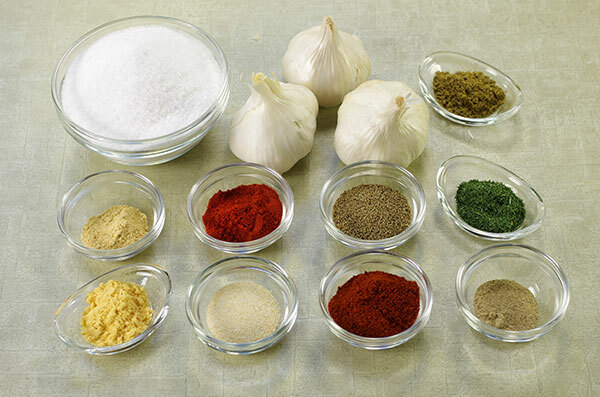 Make the rub: In a small bowl, stir together all of the ingredients until well blended. Taste and adjust the seasonings. 4. Place the orange and onion slices in the cavity. Insert a wooden skewer through the thighs to hold the drumsticks together. Place the chopped onions and the carrots on the bottom of a large roasting pan. Pour the 2 cups of stock over the vegetables. Set a nonstick roasting rack in the roasting pan and place the turkey breast-side up on the rack. 5. Roast in the center of the oven for 20 minutes. Reduce the oven temperature to 325°F and roast, basting about every 45 minutes with the pan juices, until a thermometer inserted into the thickest part of a thigh away from the bone registers 170°F and the juices run clear. You may need to add more stock if the pan becomes too dry. If the bird becomes too dark, tent a piece of aluminum foil on top. A 16-pound turkey should take about 4 hours. Be sure to check the temperature at 30-minutes intervals as the finish time approaches. 6. Transfer the turkey to a large platter or carving board. Let rest for at least 20 minutes before carving. Discard the vegetables. Make the rub 2 days ahead, cover, and refrigerate. 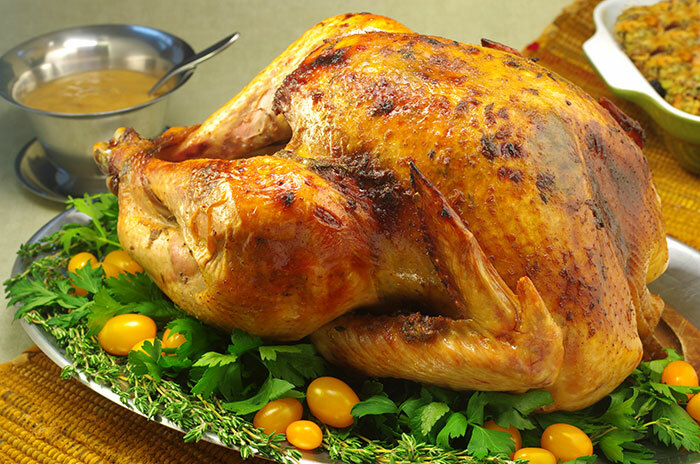 Remove both the turkey and the rub from the refrigerator 1 hour before roasting. - Stuff the turkey: Omit the onion and orange. Use your favorite stuffing. Loosely stuff the turkey in the neck and main cavities. Close the flaps with wooden skewers. A stuffed 16-pound bird should take about 5 hours to cook. 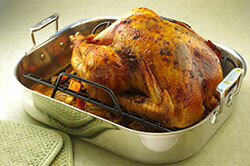 -	Use the rub on a 3-1/2 – 4-pound chicken and roast for about 1 hour at 425°F. The underrated Riesling is magic with the sweet and savory tastes in this turkey recipe. Lighter reds, such as Beaujolais Nouveau, Grenache, Pinot Noir, and Côtes du Rhône are also excellent choices. This magical seasoning will elevate the flavor of just about anything you cook. 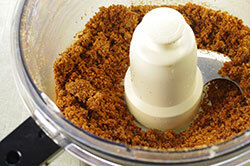 I have made a version of this recipe for years and, over time, I have simplified the method by using a food processor. 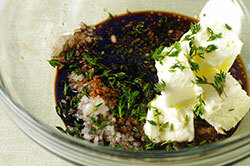 To make this even more quickly, you can purchase already peeled garlic cloves. 1. 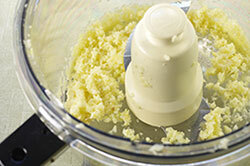 In a running food processor fitted with the metal blade, drop in the garlic cloves, and process until finely minced. 2. Combine all the remaining ingredients in a large measuring cup. Add to the garlic and pulse until completely blended. Use a spatula to scrape down the sides of the blender container and pulse again. Transfer to an airtight container or to smaller containers with shakers on the top. Keep refrigerated. Make up to 3 months ahead and refrigerate. Recipes from Seriously Simple Holidays by Diane Rossen Worthington. Published by Chronicle Books, San Francisco, CA. Copyright 2007. Reprinted with permission of the publisher. All rights reserved.